January 17- How Short Jazz Band at Musiquarium Happy Hour. 5pm. January 20 - Marina and the Dreamboats, Leah T, Blood Moon Orchestra at The High Dive for Sing It Live! January 26 - Marina Christopher Trio at The Edgewater Hotel Lounge. 21+ 9:30pm. December 6 - Marina Christopher Trio First Thursday's at Vito's Lounge. 21+ 9pm. Jeremy Bacon, piano. Ed Littlefield, drums. December 7 - Jazz Night School Fall session performances. The Royal Room. December 8 - Marina Christopher Trio at The Edgewater Hotel Lounge. 21+ 9:30pm. Joey Walbaum, keys. Nia Neal, drums. December 9 - Ian Williams and Strings at Chihuly Glass Seasonal Sundays. 1pm. December 13 - Private event with Josh Hou. December 15 - Marina Christopher Trio at The Edgewater Hotel Lounge. 21+ 9:30pm. Jeremy Bacon, keys. Chris Patin, drums. Featuring Frank Vitolo on sax. December 22 - Hot Toddies at Pacific Place Holidays. 6:30 to 8:30. December 22 - Marina Christopher Trio Holiday Sing-A-Long Spectacular! The Paragon. 9pm. December 31 - New Year's Eve at the Fairmont Hotel. Bad News Botanists and Marina and the Dreamboats. 9:30pm. No cover! November 2 - Marina Christopher Trio at The Edgewater Hotel Lounge. 21+ 9:30pm. November 27 - Marina and the Dreamboats at The Bluemoon Tavern. With SmackTalk and Freudian Slurp. 9pm. September 15 - 2nd 2aturday's Marina Christopher Trio at the Paragon. 9pm to 12am. No cover. All ages till 11. September 25 - Bad News Botanists at The Sunset. Opening for 10 Man Brass Band. August 2 - Marina Christopher Trio at Vito's. 9pm. No cover. July 5 - Marina Christopher Trio at Vito's. 9pm. No cover. July 6 - Marina and the Dreamboats First Fridays' at The W Hotel. June 7 - Marina Christopher Trio at Vito's. 9pm. No cover. June 9 - Marina Christopher Duo at Shilshole Boatfest. 2pm to 4pm. All ages and free! With Andy Short on guitar. June 9 - 2nd 2aturday's Marina Christopher Trio at the Paragon. 9pm to 12am. No cover. All ages till 11. With Chris Patin, Rob Homan and Josh Hou. June 23 - Marina and the Dreamboats at the Taste of Tacoma. 1pm. May 12 - 2nd 2aturday's Marina Christopher Trio at the Paragon. 9pm to 12am. No cover. All ages till 11. May 18 - Marina and the Dreamboats at The Edgewater Lounge. 9:30pm to 12. No cover. April 6 - Marina and the Dreamboats at The Edgewater Lounge. 9:30pm to 12. No cover. April 14 - 2nd 2aturday's Marina Christopher Trio at the Paragon. 9pm to 12am. No cover. All ages till 11. With Jeremy Jones on drums and Jeremy Bacon on piano. April 18 - Marina and the Dreamboats, Aline Vida, Primary Pulse at The High Dive. April 21 - Leah T at The Edgewater Lounge. 9:30pm to 12. No cover. April 26 - Bad News Botanists at Seamonster Lounge, with Urban Ghost. March 2 - Maltese Falcon at Cafe Nordo. 8pm. March 4 - Seattle JazzEd Ensemble Concert. Directing the Melba Liston Big Band. The Royal Room. 4pm. March 10 - 2nd 2aturday's Marina Christopher Trio at the Paragon. 9pm to 12am. No cover. All ages till 11. March 15 - Bad News Botanists at Barboza, with Withering Blooms. March 16 - Jazz Night School session concert at The Royal Room. 6:30pm. March 16 - Michael Owcharuk at Vito's. 9pm. March 19 - 14th Annual Seattle-Kobe Female Jazz Vocalist Competition at Dimitriou's Jazz Alley. 6:30pm. March 21 - Maltese Falcon at Cafe Nordo. 8pm. March 22 - Maltese Falcon at Cafe Nordo. 8pm. March 22 - Leah T and the Baked Goods, Marina and the Dreamboats at Seamonster Lounge. 9pm. March 23 - Maltese Falcon at Cafe Nordo. 8pm. March 24 - Marina Christopher Trio Plays the 90s at Columbia City Theater Bourbon Bar. 9pm to 11. Emily McVicker opens at 8pm! February 1 - Marina solo at SeaTac. 10:30am to 2:30. C Concourse. February 10 - 2nd 2aturday's Marina Christopher Trio at the Paragon. 9pm to 12am. No cover. All ages till 11. February 16 - Maltese Falcon at Cafe Nordo. 8pm. February 17 - Maltese Falcon at Cafe Nordo. 8pm. February 18 - Maltese Falcon at Cafe Nordo. 8pm. February 24 - Maltese Falcon at Cafe Nordo. 8pm. February 25 - Marina and the Dreamboats, Nora Rothman, Branik at The Sunset Tavern. 7pm. January 2 - Marina and the Dreamboats residency at The Royal Room. 10pm to 12. With Chris Patin on drums and Milo Peterson on guitar. January 3 - Marina and Andy at the Cork & Tap. 5pm to 7pm. January 9 - Marina solo at SeaTac. 8:30am to 12:30pm. January 13 - Marina Christopher Trio at the Paragon. 9pm to 12am. No cover. All ages till 11. January 16 - A Musical Celebration of Kevin Christopher. The Royal Room. 8pm. Featuring Ed Hartman, Marina Christopher, Steve Ryals, Don Dietrich, Richard Sysinger and Maia Santell. All donations go to Kevin's official memorial. January 16 - Marina and the Dreamboats residency at The Royal Room. 10pm to 12. By donation. January 19 - Marina and the Dreamboats at The Edgewater Lounge. 9:30pm to 12. No cover. January 23 - Marina and the Dreamboats residency at The Royal Room. 10pm to 12. By donation. January 25 - Marina solo at Amazon Doppler Prime. 11am to 12:30pm. 2021 7th Ave.
January 30 - Marina and the Dreamboats residency at The Royal Room. 10pm to 12. By donation. January 31 - Bad News Botanists at Chop Suey. December 1 - Jazz Night School at the Royal Room. December 9 - 2nd 2aturdays with Marina Christopher Trio at the Paragon. 9:30pm. Free! ​December 12 - Washington MS junior band concert. December 14 - Jerett Samples, Tobias the Owl, Marina and the Dreamboats at the Sunset Tavern. 9pm. December 16 - Leah T and the Baked Goods at the Edgewater Lounge. 9:30pm. December 21 - Ballard Night Out. Verity Credit Union in Ballard. 6-8pm. Free and all ages! December 31 - New Year's Eve at the Smith Tower with the Ed Littlefield Trio. November 11 - Marina Christopher Trio at The Paragon. 9:30pm. No cover. November 14 Marina and the Dreamboats open for SmackTalk at he Royal Room. 8pm. By donation. October 14-15 - Seattle Jazz Ed Girls Jazz Sleepover instructor. October 26 - Blood Moon Orchestra. Seamonster Lounge. 10pm. October 29 - How Short Jazz Band at St Clouds. 5pm to 7pm. September 4 - Marina and Frank at Westlake Park. 11:30 to 1:30. September 7 - First Thursday's at Occidental Park. 6pm. September 9 - Marina Christopher Trio at The Paragon on Queen Anne. 9:30pm. Free! August 1 - Marina and George at Shilshole Bay Marina for National Night Out. 6pm to 8pm. August 2 - Tia Quacker Tunes at Mill Creek Library. 11:30am. Free and open to the public. August 4 - Marina and Owen at Belltown Beats. 6:30pm to 7:45pm. Bell St between 2nd and 3rd. August 10 - Bad News Botanists at the Seamonster Lounge. 9:30pm. 21+. $5. Ladies get in free! August 7-11 - Shoreline/Lake Forest Park Arts Council Jazz Camp, directed by Jim Sisko. August 12 - Marina Christopher Trio at The Paragon on Queen Anne. 9:30pm. Free! August 28- Marina and the Dreamboats Out to Lunch concert series. 4:30pm to 6pm. 426 Terry Ave, Seattle, WA. August 29 - Marina Christopher Trio at the Evergreen State Fair. Family Stage. 2pm. July 4 - Marina and Owen at SeaFair Summer Fourth! VIP entertainment. July 5 - Marina at the Cork and Tap. 10116 NE 8th (inside QFC). Bellevue, WA. 5pm to 7pm. July 6 - Marina and Owen at Westlake Park. 11:30am to 1:30pm. Come for the food trucks, stay for the music! July 7 - Marina and George at Cascade Park. 4pm to 6pm. 333 Pontius Ave N. Seattle, WA. July 8 - Marina and Owen at Belltown Community Center Garden Party. 12 to 2pm. July 8 - Marina Christopher Trio at The Paragon on Queen Anne. 9:30pm. Free! July 13 - Marina and the Dreamboats at Seamonster Lounge. 9:30pm. $5pm. Ladies get in free for ladies night! July 20 - Marina Christopher Trio at Port of Seattle Unplugged. Pier 69. 6pm. July 21 - Marina and the Dreamboats at the Bite of Seattle. Mural Stage. 12pm. July 21 - Scarlet Parke at Capitol Hill Block Party. Barboza stage. 7:30pm. July 21 - Jazz Night School concert at The Royal Room. 7pm. July 29 - Jazz in the Valley Jazz Festival presents the Marina Christopher Trio. The Gard. 8:30 to 11:30. Festival pass required. June 1 - Marina and Joey at Westlake Park. 11:30am to 1:30pm. Come for the food trucks, stay for the music! June 1 - Marina and Owen at Magnuson Park Gallery First Thursday. 5:30pm to 7:30pm. June 2- Marina and Owen at the Cork and Tap. 10116 NE 8th (inside QFC). Bellevue, WA. 5pm to 7pm. June 9 - Marina and Owen at Everett Sorticulture Festival. 12pm to 2pm. June 9 - Jazz Night School Spring Session performances. 5pm to 9pm. June 10 - Marina and Owen at the Shilshole Boating Festival. 1:45pm to 4pm. Free! Family fun! June 10 - Marina Christopher Trio at The Paragon on Queen Anne. 9:30pm. Free! June 16 - Marina and Owen at the Cork and Tap. 10116 NE 8th (inside QFC). Bellevue, WA. 5pm to 7pm. June 21- Marina and Owen at the Greenwood Verity Credit Union. 12pm to 2pm. 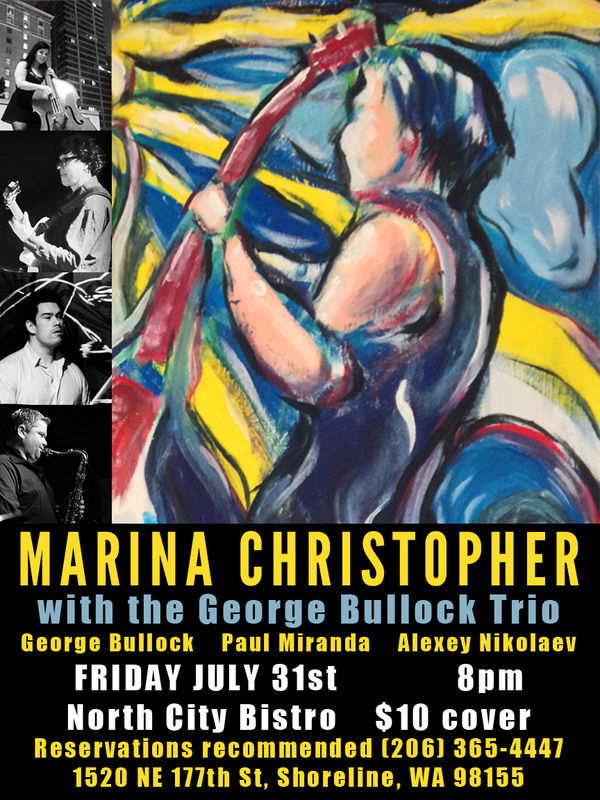 June 22 - Marina Christopher Trio at The Triple Door Musiquarium. 8pm to 11pm. June 23 - Marina and the Dreamboats at The Taste of Tacoma. Bowl Stage. 1pm. June 24 - Marina and Owen at the Shoreline Arts Festival. 11:30am. June 29 - Marina Christopher Trio at the Columbia Tower Club. 5pm to 7pm. June 30 - Leah T and the Baked Goods at the Edgewater Hotel Lounge. 9:30pm. May 1 - Bad News Botanists at Mo' Jam Mondays. Nectar Lounge. 9pm. May 4 - Capitol Hill Block Party presents Scarlet Parke Birthday Celebration! Fred's Wildlife Refuge. May 5 - Marina and Owen at the Cork and Tap. 10116 NE 8th (inside QFC). Bellevue, WA. 5pm to 7pm. May 12 - Scarlet Parke at Upstream Festival. Starbucks stage. May 13 - Good Husbands at LollaPLUza. 3pm. Pacific Lutheran University. May 13 - Marina Christopher Trio at The Paragon on Queen Anne. 9:30pm. Free! May 18 - STG presents Evan Flory-Barnes. The Music of An Acknowledgement of a Celebration: Inheritance, Authenticity and Healing. The Neptune Theater. 8pm. May 19 - Marina and Owen at the Cork and Tap. 10116 NE 8th (inside QFC). Bellevue, WA. 5pm to 7pm. May 24 - Marina and George at Occidental Park. 11:30am to 1:30pm. Come for the food trucks, stay for the music! May 25 - Let's Be Silver (Musical Workshop). The Pocket Theater. 7pm. May 26 - Marina and Owen at the Cork and Tap. 10116 NE 8th (inside QFC). Bellevue, WA. 5pm to 7pm. April 1 - Jackson Street Jazz Walk vocalists at Ernestine Anderson Place. 5pm to 10pm. Marina will play bass all night, plus a set of her own vocal music. April 3 - Mo' Jam Mondays at the Nectar Lounge, featuring Tai Shan. April 7 - Marina Christopher Duo at Occidental Park. 11:30am to 1pm. April 7 - Marina Christopher Quartet at the Cask & Trotter. 9pm to 12pm. Highway 99 in Lynnwood, WA. April 8 - Marina Christopher Trio at The Paragon on Queen Anne. 9:30pm. Free! April 14 - Marina and Owen at the Cork and Tap. 10116 NE 8th (inside QFC). Bellevue, WA. 5pm to 7pm. April 15 - Marina and the Dreamboats open with Breaks and Swells and The Georgetown All-Stars. The Highdive. April 21 - Marina and Andy at the Cork and Tap. 10116 NE 8th (inside QFC). Bellevue, WA. 5pm to 7pm. April 22 - King County Earth Day Repair Fair at White Center with music from Marina and Joey while you wait. Sets at 9:45am and 11:15am. Bring household items to be repaired for free! April 24 - Seattle JazzEd Combo concert. The Royal Toom. 7pm. Free! April 28 - Marina and Owen at the Cork and Tap. 10116 NE 8th (inside QFC). Bellevue, WA. 5pm to 7pm. April 29 - Bad News Botanists at the Seamonster Lounge. 7pm to 9pm. March 5 - Raising the Bass Line series at Columbia City Theater Lounge. March 6 - Seattle Kobe Female Jazz Vocalist Audition at Dimitrou's Jazz Alley. 6:30pm. Doors at 6. March 7 - Marina Christopher Duo at Amazon Prime. 11am to 12:30pm. 2021 7th Ave. With Andy Short on guitar. March 9 - Scarlet Parke at Neumo's. March 10 - Marina Christopher Duo at Occidental Park. 11:30am to 1pm. March 10 - Marina Christopher Duo at Pacific Place. 5pm to 7pm. March 11 - Marina Christopher Trio at The Paragon on Queen Anne. 9:30pm. Free! March 14 - Jerett Samples at the Sunset Tavern. 10pm. March 15 - Marina solo at Sea Tac Airport. 10am to 2pm. March 17 - Marina and Owen at the Cork and Tap. 10116 NE 8th (inside QFC). Bellevue, WA. 5pm to 7pm. March 19 - The Bad News Botanists open for The Black Clouds. Substation. March 24 - Marina and Owen at the Cork and Tap. 10116 NE 8th (inside QFC). Bellevue, WA. 5pm to 7pm. March 25 - The Walking Hat Trio at La Spiga. 8pm to 10:30. Jonas Myers, piano. Cutts Peasley, drums. March 26 - Seattle Jazz Ed Meet Your Instrument Open House. Sessions at 12pm and 1pm. Try out an instrument and talk to teachers. Plus free pizza! March 29 - Marina solo at Sea Tac Airport. 9am to 1pm. March 29 - Marina Christopher Trio at Capitol Cider. 8pm. No cover. Owen Proto, guitar. Chris Patin, drums. March 31 - Marina and Owen at the Cork and Tap. 10116 NE 8th (inside QFC). Bellevue, WA. 5pm to 7pm. February 11 - Marina and Owen at the Cork and Tap. 10116 NE 8th (inside QFC). Bellevue, WA. 5pm to 7pm. February 11 - Marina Christopher Trio at The Paragon on Queen Anne. 9:30pm. Free! February 13 - Mike Lewis Quartet at the Royal Room. 7:30pm. February 20 - Marina Christopher Trio at the Triple Door Musiquarium Lounge. 8pm to 11pm. Free. 21+. February 22 - Marina solo at Hot Stove Society by Tom Douglas. 5pm. February 24 - Marina and Owen at the Cork and Tap. 10116 NE 8th (inside QFC). Bellevue, WA. 5pm to 7pm. February 24 - Marina and Owen at the Skylark. 9pm. Also check out Marina play with Jerett Samples at 10pm! January 6 - Marina and Owen at the Cork and Tap. 10116 NE 8th (inside QFC). Bellevue, WA. 5pm to 7pm. January 9 - Grand opening of Amazon's Amelia building in South Lake Union. 10am. with Andy Short on guitar. January 9 - Blood Moon Orchestra at Mo' Jam Mondays at the Nectar Lounge. 10pm. January 12 - Crash the Glass hosted by Michelle Searle. Columbia City Theater. 8pm. January 13 - Leah T at The Edgewater Hotel. 9:30pm. January 14 - Marina Christopher Trio at The Paragon on Queen Anne. 9:30pm. Free! January 17 - Marina solo at Occidental Park. 11:30am to 1:30pm. January 21 - Marina and Owen at the Cork and Tap. 10116 NE 8th (inside QFC). Bellevue, WA. 5pm to 7pm. January 23 - Marina and the Dreamboats, D'Vonne Lewis' LIMITED EDITION at The Royal Room. 7:30pm. January 26 - Scarlet Parke at Barboza. Opening for Spencer Glen CD release. January 27 - Seattle JazzEd combo Jam. 5pm. January 28 - Marina Christopher Trio at The Paragon. 9:30pm. December 2 - Marina and Owen at the Cork and Tap. 10116 NE 8th (inside QFC). Bellevue, WA. 5pm to 7pm. December 3 - Snohomish County Music Project presents The Carpenters and Simon & Garfunkel. Northwest Music Hall. Everett, WA. December 7 - Marina Christopher on Winter Sessions on Rainier Vallery Radio KVRU. December 8 - Marina and Owen at the Seattle Chamber of Commerce Public Officials Reception. 5pm to 7pm. December 10 - Marina Christopher Trio at The Paragon on Queen Anne. 9:30pm. Free! December 18 - Cirque Musica Holiday Spectacular at Xfinity Arena. 6pm. Everett, WA. December 23 - Marina Christopher Duo at Occidental Park. 4pm to 6pm. December 23 - Christmas Party at the Blue Moon with 45th Street Brass and Marina and the Dreamboats. $8. 9pm. December 30 - Marina and Owen at the Cork and Tap. 10116 NE 8th (inside QFC). Bellevue, WA. 5pm to 7pm. December 31 - New Year's Eve Party at Jazzbones! Featuring Scarlet Parke. Tacoma, WA. November 4 - Marina and George at the Cork and Tap. 10116 NE 8th (inside QFC). Bellevue, WA. 5pm to 7pm. November 4 - Marina Christopher Trio at The Socialites Presents Artist Showcase. Taste of the Caribbean. 9pm $5. November 7 - Mo' Jam Monday's featuring Isaac Castillo and his group "Maluhia" with Davy Nefos and Marina Christopher. November 10 - Marina solo at Sea-Tac airport. 9am to 1pm. November 11 - Marina and Owen at the Cork and Tap. 10116 NE 8th (inside QFC). Bellevue, WA. 5pm to 7pm. November 12 - Marina Christopher Trio at The Paragon on Queen Anne. 9:30pm. Free! November 14 - Mo Jam Monday's Featuring Marina Christopher and her birthday show! November 18 - Marina and Owen at Westlake Park. 11:30am to 1:30pm. November 19 - Scarlet Parke VIP EP release party! Sunset Tavern. November 22 - Marina solo at Sea-Tac airport. 9am to 1pm. November 23 - Marina Christopher at Amazon. 310 Terry Ave N. 4pm to 6pm. November 23 - LoveCityLove Wednesdays. 1406 E Pike St. $5 before 9pm, $10 after. November 25 - Marina Christopher Trio opens for Santa!!! Redmond Town Center. 5pm to 7pm. Marina Christopher, bass and vocals. George Bullock, guitar. Chris Patin, drums. November 26 - Marina and Owen at the Cork and Tap. 10116 NE 8th (inside QFC). Bellevue, WA. 5pm to 7pm. November 29 - Marina Christopher at the Musiquarium. 8pm to 11pm. Free! With Owen Proto, guitar and Chris Patin, drums. October 2 - Balboa Happy Hour with the How-Short Jazz Band. Amber. 5pm. October 5 - LoveCityLove Wednesdays. 9pm. 1406 E Pike. October 8 - Meklit Hadero at Fundraising Gala for the Seattle Ethiopian Community. Emerald Downs Ballroom. 5pm. Auburn, WA. October 8 - Marina Christopher Duo at The Paragon on Queen Anne. 9:30pm. Free! October 12 - LoveCityLove Wednesdays. 9pm. 1406 E Pike. October 13 - Marina Christopher Trio at Diva Furniture Open House. 5pm to 8pm. October 14 - Marina Christopher Trio at Egan's Jam House. 9pm. $5. October 17 - Marina and the Dreamboats at Tula's. Opening for Paul Harshman's pH Factor Big Band. $10. 7:30pm. October 22 - Seattle JazzEd Rhythm Section Masterclass. 1pm. Neuroscientist and musician Thomas Deuel, working with composer Marcin Pączkowski, visualist Ben Van Citters, and accompanied by an ensemble of musicians, will produce music and projected visuals in real time directly from his brain waves using his Encephalophone, a brain to music interface. $10. Get your tickets here. October 23 - Marina solo at SeaTac Airport. 9am to 1pm. B concourse. October 26 - Marina solo at SeaTac Airport. 9am to 1pm. N concourse. October 26 - LoveCityLove Wednesdays. 9pm. 1406 E Pike. October 28 - Marina and Owen at the Cork and Tap. 10116 NE 8th (inside QFC). Bellevue, WA. 5pm to 7pm. October 29 - Marina Christopher Duo at Amazon Doppler Plaza. 12pm to 2pm. 6th and Lenora. ​September 1 - The Walking Hat Trio at La Spiga. 7pm to 9:30pm. Jonas Myers, piano. Cutts Peaslee, drums. Marina Christopher, bass. George Bullock, guitar. Nick Allison, keys. Jamael Nance, drums. Alexey Nikolaev, sax. David Marriott, trombone. September 4 - Marina Christopher Trio at Vintage Aircraft Weekend at Paine Field. September 6 - Marina solo at SeaTac. 11am to 3pm. September 9 - Anna Laube at Peddlar Brewery. 7:30 to 9:30. September 10 - Marina Christopher Duo at Amazon Plaza. 6th and Lenora. 12pm to 2pm. September 10 - Marina Trio at the Paragon. 9pm to 12am. Free. All ages until 10pm. Owen Proto, guitar. Chris Patin, drums. September 16 - Marina solo at SeaTac Airport. 9am to 1pm. September 18 - Clarkia Cobb at The Seamonster Lounge. 8pm. September 21 - LoveCityLove Wednesdays. 9pm. 1406 E Pike. September 24 - Friend Zone House Show featuring Marina and the Dreamboats, Bad News Botanists. September 26 - Marina at Amazon Parent Day. 6th and Lenora. Arizona roof. 12pm to 2pm. September 28 - LoveCityLove Wednesdays. 9pm. 1406 E Pike. September 30 - Scarlet Parke at The Green Frog. Bellingham, WA. Opening for Babycakes. August 2 - Out to Lunch Concert series presents Scarlet Parke. 5th and University.1200 5th Ave. 12-1:30pm. August 6 - Marina Christopher Duo at Verity Credit Union Wallingford. 2pm to 4pm. August 7 - Marina solo at SeaTac 11am to 3pm. August 7 - Balboa Happy Hour at Amber, featuring The How Short Jazz Band. 5pm to 7pm. $10 suggested donation. Joshua Hou, accordion. Andy Short, guitar. Marina Christopher, bass. Max Holmberg, drums. August 12 - Shoreline Jazz Camp Final Concert. 7pm. Shorecrest High School. Free. August 14 - Marina and Owen at the Insignia open house. 11am to 2pm. 588 Bell Street, Seattle, WA 98121. Free event, but you must register to attend. August 17 - LoveCityLove Wednesdays. 14th and Pike. 9pm. $10. August 18 - Mark Lilly Quartet Birthday Show at North City Bistro. $10. 7pm to 9:30pm. Featuring: Nick Allison, piano. Marina Christopher, bass. Jeff Busch, drums. August 19 - The Walking Hat Trio at Egan's. $5 cover. August 20 - Leah T at the Edgewater. 9:30pm. August 21 - Marina solo at SeaTac airport. 11am to 3pm. 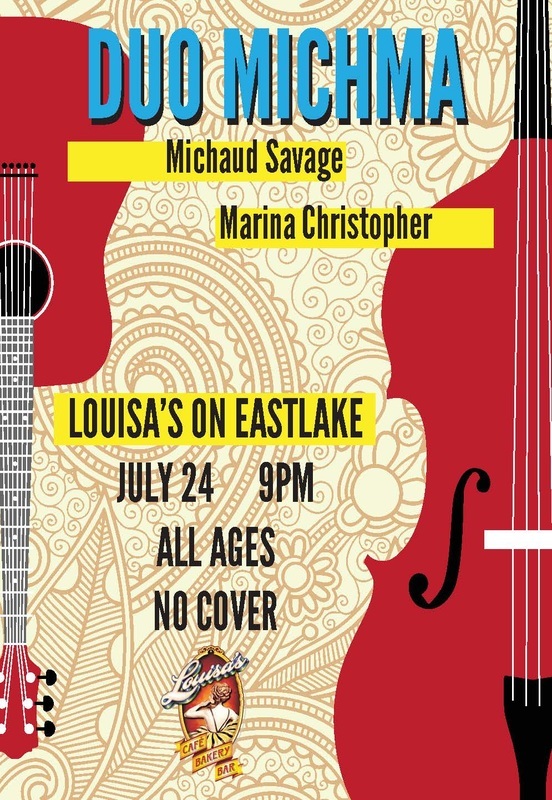 August 25 - Marina Christopher Plays On The Dock Concert Series. 6:30pm to 8:30pm. August 26 - Marina Christopher Duo at Verity Credit Union Beacon Hill. 11am. August 26 - Jacob Taylor Band at Tim's Tavern. 8pm to 9pm. August 27 - Marina and Owen at Wholefoods Anniversary Celebration. Redmond Wholefoods. 12pm to 2. August 27 - Marina and Owen at Station U-Brew. 4pm to 6pm. Puyallup, WA. August 27 - Triple Door Musiquarium with Cole Schuster, guitar and Max Holmberg, drums. 9pm. August 29 - Marina Christopher on KPLU Studio Sessions. 88.5FM. 12:15pm. George Bullock, guitar. Nick Allison, keys. Jamael Nance, drums. Frank Vitolo, tenor sax. Peter Daniel, bari sax. August 29 - LoveCityLove hosts Summer on the Plaza: Library Love. Seattle Central Public Library. 5pm to 6pm. August 31 - LoveCityLove Wednesdays. 14th and Pike. 9pm. $10. July 2 - Marina solo at SeaTac Airport. 10am to 2pm. July 4 - Marina and Owen play SeaFair Summer Fourth at Gasworks Park! 5:30 to 7:30. VIP area. July 6 - LoveCityLove. 1406 E Pike Street. 8pm. Live improvised hip hop, poetry and performance art. July 7 - Marina solo at SeaTac Airport. 10am to 2pm. July 9 - ﻿﻿Billy Brandt presents The Big Gig. Featuring several Seattle artists, including Marina Christopher.﻿ $25. July 15 - Marina solo at SeaTac Airport. 11am to 3pm. July 16 - Marina and Owen at Verity Credit Union - Lynnwood Branch. 11am to 2pm. Customer Appreciation BBQ! July 16 - Marina and George at the Paragon. 9pm to 12am. Free. All ages until 10pm. July 20 - Marina solo at SeaTac Airport. 11am to 3pm. July 21 - LoveCityLove at the 5th Annual Volunteer Park Picnic. 6pm. July 26 - Marina solo at SeaTac Airport. 11am to 3pm. July 28 - Marina and George at Westlake Park. 4pm to 6pm. July 30 - Scarlet Parke at Whaling Days Festival. 4pm. July 30 - Marina and Owen at the Paragon. 9:30pm to 12:30am. Free. All ages until 10pm. June 1 - Marina Solo at SeaTac Airport. 10am. June 1 - LoveCityLove. 1406 E Pike Street. 8pm. Live improvised hip hop, poetry and performance art. June 2 - ﻿Listen Up Summer Music Series at Pacific Place Presents "All About that Bass" featuring Scarlet Parke and the Sweet Honeys Scarlet Parke fronts her band for 2 hours of music! 5pm to 7pm. Pacific Place Atrium. 600 Pine St, Seattle, WA 98101. All ages and free! June 3 - Marina Solo at SeaTac Airport. 11am. June 4 - Marina Christopher at Capp's Club in Kenmore, WA. 7pm. June 7 - Paul Miranda Hosts the Queen Anne Sessions. The Paragon. 9pm. No cover. June 8 - LoveCityLove. 1406 E Pike Street. 8pm. Live improvised hip hop, poetry and performance art. June 11 - Marina Christopher Duo at the Paragon. 9pm. No cover. June 13 - Marina solo at SeaTac Airport. 11am. June 15 - LoveCityLove. 1406 E Pike Street. 8pm. Live improvised hip hop, poetry and performance art. Marina Christopher fronts her trio for 2 hours of music! 5pm to 7pm. Pacific Place Atrium. 600 Pine St, Seattle, WA 98101. All ages and free! Owen Proto, guitar. Chris Patin, drums. June 18 - Anna Laube at Populuxe Brewing in Ballard. 5pm-6pm. June 20 - Mo' Jam Mondays at the Nectar Lounge, featuring world-class trumpeter Ingrid Jensen! June 22 - LoveCityLove. 1406 E Pike Street. 8pm. Live improvised hip hop, poetry and performance art. June 26 - Marina solo at SeaTac Airport. 10am to 2pm. June 29 - LoveCityLove. 1406 E Pike Street. 8pm. Live improvised hip hop, poetry and performance art. May 4 - LoveCityLove. 1406 E Pike Street. 8pm. Live improvised hip hop, poetry and performance art. May 8 - Marina solo at SeaTac Airport. 11am to 3pm. May 11 - LoveCityLove. 1406 E Pike Street. 8pm. Live improvised hip hop, poetry and performance art. May 14 - Scarlet Parke at Battle in the Burg at Central Washington University. Ellensburg, WA. May 15 - Scarlet Parke at Pono Ranch. 7pm. May 17 - Marina solo at SeaTac Airport. 10am. ​May 18 - LoveCityLove. 1406 E Pike Street. 8pm. Live improvised hip hop, poetry and performance art. May 19 - Alex Dugdale Trio at EuroPub. 8pm to 10:30. May 22 - Murphy-Tyler Band at the U-Dist Street Fair. Noon-1pm. May 25 - Marina solo at SeaTac Airport. 9am. May 28 - ﻿Marina Christopher Duo at the Paragon. 9pm. No cover. April 2 - Marina solo on 7th and Lenora, 11am to 1pm. Outside the Amazon building. April 6 - LoveCityLove. 1406 E Pike Street. 8pm. Live improvised hip hop, poetry and performance art. April 8 - Sullivan's Steakhouse. 6:30 to 10:30. Live jazz, pop, rock. April 9 - Scarlet Parke at Aaron Dunlop House show. 7:30. April 13 - LoveCityLove. 1406 E Pike Street. 8pm. Live improvised hip hop, poetry and performance art. April 16 - Paul Miranda Trio, featuring Frank Anderson. 13 Coins Restaurant, downtown Seattle. 9pm to 1 am. April 20 - LoveCityLove. 1406 E Pike Street. 8pm. Live improvised hip hop, poetry and performance art. April 22 - Marina and Owen at The Cork and Tap. 5pm to 7pm. April 23 - Marina and George at The Paragon. 9pm to 12am. March 4 - Snohomish County Music Project presents "Classic Vinyl", a benefit for Everett Senior Services. Featuring members of the Seattle Rock Orchestra . Xfinity Arena. March 6 - Step into Spring with the Nick Allison Trio. Guemes Island Community Center. 4pm. $15. March 11- Marina with Owen Magelssen, guitar, at Cork & Tap. 5pm. Bellevue, WA. March 12 - Carrie Wicks at Bremerton Yacht Club. Benefit for Clam Island Rowing w/ Billy Brandt, Aria Prame & Nick Allison on keys, Marina Christopher on bass. 7:00 to 10:00 pm. March 13 - Clarkia Cobb at the Seamonster Lounge. 8pm. February 8 - Scarlet Parke at Sunset Tavern. 8pm. February 12 - Marina with Owen Magelssen, guitar, at Cork & Tap. 5pm. Bellevue, WA. February 13 - Marina and Owen Play the Paragon. 9pm. No cover. February 26 - Marina with Owen Magelssen, guitar, at Cork & Tap. 5pm. Bellevue, WA. January 5 - Marina Solo at SeaTac Airport. 9am. January 12 - Trio Michma at Triple Door Musiquarium. 9pm. No cover. January 17 - Marina Solo at SeaTac Airport. 9am. January 23 - Gigs4U Booth at Everett-Lynnwood Wedding Expo. 11:30am. Xfinity Arena. January 29 - Scarlet Parke at The Crocodile. Nolan Garrett CD Release. January 30 - Marina Solo at SeaTac Airport. 11am. December 3 - Eugenie Jones at the Triple Door Musiquarium. 9pm. No cover. December 4 - Marina Christopher Solo at the Cork and Tap. 5 to 7pm. 10116 NE 8th St., Bellevue, WA. December 5 - Marina Christopher Trio. Private event. Cole Schuster, guitar. Brian Kirk, drums. December 7 - Mo' Jam Mondays featuring Marina Christopher. Nectar Lounge. 10pm. December 8 - Duo Michma. Private event. December 9 - Marina Christopher Trio. Private event. Milo Petersen, guitar. Brian Kirk, drums. December 9 - Private event. Hans Brehmer, piano. Brian Kirk, drums. December 12 - Dunlap House Concert sponsored by GigTown. 7:30pm. With Owen Magelssen on guitar. Private show, but spaces are available. Contact Marina using the contact page for more info. December 17 - Scarlet Parke at Barboza. with Jazmarae Beebe and Spencer Glenn. 8pm. $8. December 18 - Eugenie Jones at the North City Bistro. 8pm. December 18 - Marina Christopher at Mars Bar with Owen Magelssen on guitar. 11:59pm to close. December 19 - Marina Christopher at Middleton Brewing. 7pm. Everett, WA. December 26 - Marina Christopher at The Paragon with Michael Owcharuk, piano. 9:30 to 12:30. November 11 - Live concert filming at North City Bistro. 4pm. Free! Cole Schuster, guitar. Adam Robb, trumpet. Jeremy Ueckert, drums. November 15 - Eugenie Jones at Capitol Cider. Bill Anschell, piano. Steve Korn, drums. 5:30 to 8pm. November 21 - Mo' Jam Mondays episode of Band in Seattle on the CW11. 11pm. November 28 - Marina Christopher at Paragon Bar and Grill 9:30pm. Kevin Proudfoot, piano. November 29 - Sing it Live at the Seamonster Lounge, 10pm. With Michelle Searle, Katrina Kope, Melissa Montalto, Kathy Moore, and Heather Thomas. No cover! September 9 - Leah T at Capitol Cider with Marina Christopher, Max Holmbergs and Cole Schuster. 8pm. September 12 - Paul Miranda Trio at SeaTac 13 Coins, featuring Marina Christopher on bass and vocals. 9pm. Club members only, but stay tuned for opportunities to be a guest! August 9 - Murphy-Tyler Band at SalmonFest. 2pm Lake City. August 11 - North City Jazz Walk with Shoreline Jazz Camp. Directed by Jim Sisko. 7pm. August 13 - Marina Christopher solo at SeaTac Airport. 9am to 1pm. ﻿﻿August 15 - Eugenie Jones at Langston Hughes Performing Arts Institute. 6:30pm. August 22 - Marina Christopher Solo at Westlake Park. 12pm to 2pm. August 22 - Champagne Honeybee at Art and Nature Festival 4pm to 5pm. West Seattle. August 23 - Duo Michma at SeaTac Airport. 10am to 2pm. 6pm, followed by more music and fireworks! 13 Coins SeaTac. 9:30pm. 21+. No cover. 11am to 3pm. Sponsored by Gigs4U and SeaTac Airport vendors. 13 Coins Seattle. 9:30pm. 21+. No cover. 9am to 1pm. Sponsored by Gigs4U and SeaTac Airport vendors. June 12 - Billy Brandt and the Thing and the Stuff Band. 13 Coins Downtown Seattle. 9:30pm. June 16 - Marina Christopher at Sea-Tac Airport. 9am to 1pm. Sponsored by Gigs4U. June 19 - Marina Christopher at Westlake Park. 4:30pm to 6pm. Sponsored by Seattle Parks and Recreation. May 26 - Wedgewood Elementary with: Emily Westman, piano. Heather Thomas, drums. 6pm. Acoustic versions of classic rock, blues, RnB and original music. Singers come sing. Players come play. Hangers come hang.